This week on the Digital Transformation Show, we interviewed Merlin Luck. Merlin Luck has been with Salesforce for 6 years. He started in Business Development then move through various Account Executive roles, into his current leadership position. 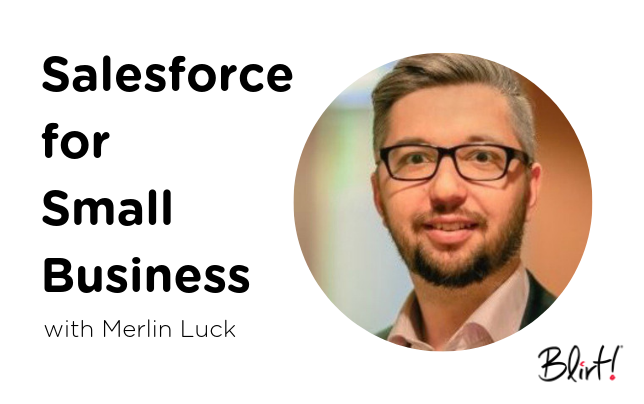 Now Merlin leads a team of Salesforce Account Executives in the small to medium business market and loves that his workplace is entrepreneurial yet also a market leader. This provides amazing opportunities and support with the freedom to be disruptive, and really flex those entrepreneurial muscles. Merin was bought up in a hippy commune, so a life in the corporate world was never really on the cards. Early on in his career he founded his own retail fashion business and grew his team to 13. Unfortunately, that entire business collapsed. With a wife and baby to support, he decided it was time to get a ‘real job’ – and joined Salesforce. Initially Merlin’s plan was to stay for maybe three years, clear his debt then go start again in the start-up world. Six years later he is still with Salesforce, feels fulfilled and happy and couldn’t ever consider leaving. It’s funny – the very thing that seems like something you don’t want turns out to be the best possible thing that could ever happen. That’s testament to the culture of intrapreneurship at Salesforce. Salesforce hasn’t lost its roots, it still acts like a tech start-up out of San Francisco. It helps that the technology is unrivalled in its capability. The people who sell it the technology truly believe in the product and how it can help their clients. Taking a step back and looking at Salesforce’s journey is impressive. The hyper growth it has received; nineteen years ago it was four people in a rundown apartment in San Francisco to now employing over 35,000 people globally, not including all partners and careers its created. Many customers believe that Salesforce is a conglomerate organisations design only for enterprise clients – which is just not the case. The best way to think about it is to think of it as your own business or having your own business. Merlin says he thinks about his own business and how he hadn’t invested in those important things like technology. When your business is small with a team of one or two, it’s easy to coordinate the day to day activities but as you grow your business becomes in-efficient without the proper technology stack. Customer centricity is another important factor to consider when you’re faced with the task of scaling a business. You lose customer centricity due to differing touch points, multiple employees and the different moving parts. You can lose sight of who is who. Customer centricity and hyper growth all revolve around smart, connected technology. Clear visibility of cash flow, data clarity, communications across the business and collaboration between teams – those things cannot be scaled on gut instinct. Merlin says that his sense of belief comes from first understanding how hard it was growing his own business and that he can help his customers realise how much easier it can be. A two-person start-up can get the best technology in the world based on their level of maturity. The great thing is not having to buy something that suits your requirements now but doesn’t grow with your business rather, buy the tech that suits you now and into the future. You cannot be competitive with your marketing strategy if that doesn’t deeply connect to your technology strategy. It’s the same for customer service, finance, operations – even your employees expect it. Customers do not expect a linear experience when dealing with your organisation, they see it all as one. To the customer, things do not happen in isolation – they are all connected. The tech needs to empower your business to connect it all. This is the true definition of customer experience. Merlin says that he often notices that small businesses have a reactive approach to their technology. They are running so fast, wearing so many hats – with no bandwidth to step back and look at the big picture. For example: A business hires more salespeople to keep up with enquiry demand then realise they need a platform to manage their activity. They then hire a marketer to get more qualified leads then implement a great piece of marketing technology. Marketing and sales are doing such a great job that they need to hire more customer service representatives then realise they need a platform for managing complaints and warranties. As a result of this approach, they end up with a Frankenstein of siloed applications. Many applications say they are open and connect with other platforms. This may be the case but having a customer centric, single source of truth approach is fundamentally impossible due to each application holding its own records based on how it’s interacted with the customer. What differentiates single platform solutions like Salesforce? The key point of differentiation of Salesforce is that its single platform allows all the best apps and tools to be built on top of it, live, integrated into the data. The platform itself is the key source of truth that records all touch points and information to allow a truly 360 degree customer view. Administrating one platform is less of a drain on IT and now with AI being built in, the opportunity for small businesses is unprecedented. This technology is crucial for any business that plans to disrupt and dominate their industry. The term technology debt is something a lot of small to medium businesses would be aware of who have made the switch from siloed technology structures to a singular platform like Salesforce. Your organisation will spend so much time investing into the numerous platforms; so much data, so many processes, so much training, that when the inevitable ‘growth roof’ is hit, you have to dismantle everything and translate it into the new system. This method is definitely not the end of the world but a far easier way to set your business up for success is to make the investment in the right technology from the start. This often-overlooked component will heighten your chances for success as your business grows. Just because software like Salesforce is single platform, doesn’t mean that you need to deploy the whole thing from day one. We recommend a crawl, walk, run approach. Iteration over time is best practice. Implementing the entire system at once would be very disruptive and too expensive for most business to do successfully. Our implementation approach is often quote the paradox. The less you do the more value you see, not the other way around which is often surprising for a lot clients. Most people think that the more you spend, the more you change, the more value they will create – which is just not true. To further help understand Salesforce, it’s a single platform with a bunch of great apps easily downloadable from the App Exchange and is all custom code-able. It really is the greatest meccano set for businesses of the 21st century. Salesforce and the App Exchange are similar in concept to the iPhone and the Appstore. The iPhone is the single platform and the app store is where developers from anywhere in the world can build an app that you can download. Salesforce works exactly the same. The great thing about the App Exchange for customers is that each app is highly specialised which makes the market places highly competitive. In such an ecosystem, innovation and value for money are driven further and further each day – all build on the one platform. We asked Merlin what one message he had for small businesses considering what they need to do when approaching their technology structure. If you require assistance through any of these stages, get in contact with us. Whether you’re a Marketing Manager, Marketing Specialist or an employer looking for the right type of marketing help, it’s important you know the key attributes of what we call ‘The XMarketer”. When it comes to Digital Transformation, The XMarketer is like Keanu Reeves was to the Matrix, the tip to the spear or what Freddie Mercury was to Queen. Whatever your analogy, you need an XMarketer to drive digital transformation. You can listen to the full podcast about the XMarketer here on “The Digital Transformation Show”. Before we deep dive into the XMarketer, it’s important to firstly understand how marketing has changed in modern times. Over the course of the last 20 years there have been five major tech driven waves of change to wash over the world. Marketing is one of these waves but also is now impacted by all of these waves of change. The CRM was often referred to as the sales persons best and worst enemy. Great for holding data and generating reports but tedious to update. The inception of the sales focused CRM saw the first wave of streamlining sales processes begin to emerge, and today its business suicide not have one. Service technology has revolutionised the way in which make deliveries using GPS beacons instead of recording logbooks, provide customer support with online chat and integrated tele-systems and communicate with those who are ‘in the field’. The early marketing technology platforms enabled marketers to send email series based on an action such as showing an interest in a particular product. Today marketers focus on collecting information about their prospects while the marketing technology delivers personalised content, showing that organisations know and understand their customers. From the inception of ecommerce, to PayPal, to apple pay and automated click to quote functionality, Fintech completely change the way we interact and pay for almost everything. 5. Artificial Technology – From Now. The new wave that will truly take a hold of the way we communicate as marketers is AI. Machine learning can unlock the secrets behind consumer readiness to buy, use the data to develop intuitive solutions and target prospects to accurately you’d swear someone is reading your thoughts. The Marketing Technology (Martech) wave started to flow in 2007 – with early automation platforms using basic functionality. Today we now have some of the most sophisticated automation technologies using rich and expansive data, ultimately changing the way how marketers work, who they work with and what they work on. An XMarketer is a term we use to describe leaders in the marketing community who push, innovate and better the customer experience to further drive the experience economy. They lead their teams in a way that allows the skills of the individuals in their team to reach their peak performance through using the right technology and understanding clear strategy in the 21st century of marketing. What are the characteristics of an XMarketer team? Continuous improvement as a team is the practice of becoming 1% better each day and allowing those small efforts to compound. Over time those small efforts amount to a scalable, high performing team. It’s essence is to make slight adjustments continually for the purpose of affecting large change in over a longer period. For Example: A customer journey designed to take prospects through a product features showcase will be optimised hundreds of times over the course of a year. By the end of that year, all drop off points, conversion rates, timings etc would have been tested, compared and optimised to a point where positive outcomes are maximised. It wasn’t anyone activity that made this difference, but the cumulation of the hundreds of adjustments made over the course of the year. A connected team is a good team. Having the technology and openness do collaborate effectively around the things that matter, in real time – is what moves the needle on team productivity and innovation. All team members know as much as each other and therefore can apply their expertise with equal context. The marketers funnel is no longer a one size fits all process. A team of Marketers work collectively toward personalised journeys and creating content to suit an outcome based on an activity is the key to unlocking journeys that work. For example: Say you sell pushbikes online. If a prospect enquiries on a mountain bike, it’s logical to take them on the Mountain bike journey – showing them all the different mountain bikes and accessories they could purchase. But later they re-visit your site and start looking at road bikes. Your journey should capture this data and pivot away from mountain bikes and toward road bikes – all automated, all in real time. Ever heard the term ‘content is king’? Well today content is more important than ever. A team that know and understand that the right type of content, served to the right people, on the right platforms at the right time is the the difference between being head, and not. Today the consumer wants to know more than ever, details about the products they purchase so it’s important for a team of marketers to know the key is in the content – and produce it. If you ever hear a marketer say ‘back in my day’ – run a mile. Technology is changing the way our society operates and marketers are always at the forefront, pushing boundaries and making the customers life easy. XMarketer teams use the best technology to get the best result and can’t afford to be stuck in their ways. This last point isn’t necessary specific to XMarketer teams, and can be applied to all teams across any organisations that value high performance. Teams and individuals that have a purpose in their roles and understand how their purpose contributes toward the vision of their organisation are the ones that drive change for the better. What individual skills does the XMarketer exude? Brand – Knowing a brand is more than a logo, but an entity that represents a certain set of values and attributes that customers can identify with. Customer Experience – Marketers that understand the true value uplift in their offerings come from the customer experience – not from being cheaper, offering better quality etc. Content – The ability to create content that solves a customer problem or helps a customer learn more about your product and how they can use it in their personal circumstances will accelerate any sales process. Data Analytics – Being able to analyse data, pick trends, identify opportunities and spot weaknesses in marketing data is the insight and fuel required to drive the majority of today’s marketing activity. The answer is always in the data. MarTech – Embracing new technology, mastering the technology and optimising your tech stack toward customer centricity and customer success now a non-negotiable for modern Marketer, let alone an XMarketer. Leadership Development – In marketing especially, good leadership skills are crucial to cultivate a team of XMarketers. To focus on what matters and lead your team toward it is a strife difference to that of marketing leaders who focus solely on CTRs, ROIs and A/Bs. Performance Management – Performance management is less about exposing the weaker performers, but to empower those team members to be accountable for their objectives and feel supported to achieve it. If you need to build a team of XMarketers or bring your marketing team up to speed – talk to us. If you are a small to medium enterprise in Australia, there are likely two components of your business that you focus on; cashflow and growth. The balancing act is having enough cashflow to invest into growth tactics through digital transformation and the two speed business is a model that positions organisations with a competitive advantage. The two-speed business identifies a market gap outside of business as usual – and captures it. Whether it’s a business within a business or a change in product offering, the two-speed business adapts to consumer demands and services them specifically. The gear/speed analogy in this framework signifies the speed at which each cog turns. A two-speed business is one that has differing business models operating at two different speeds – yet still under the one entity. This is usually summarised as one cog moving slowly doing the big, important work that has higher value. The smaller, faster moving cog aims for those quick wins and quick turnarounds with often quicker financial returns of a lesser value. The greatest advantage a two-speed business has over those with a single gear is the relationship between them. Smaller projects can roll off the small gear onto the big one and vice versa. The ability to switch speeds gives an organisation strong capability in agility and delivery. A use case may be, if an organisations typical lead-to-transaction window is 8 weeks, the organisation may create an additional product that has 2-week lead to transaction window. This gears the entire business at two different speeds and creates different dynamics across the financial and operational pillars of the organisation. Stage 1 – Basic tools power the organisation to a point where it can operate satisfactorily. E.g. Emails, website, payroll etc. Stage 2 – Using advanced digital tools to drive the efficiencies inside the business. E.g. Cloud storage, e-commerce, IOT, Social Media. 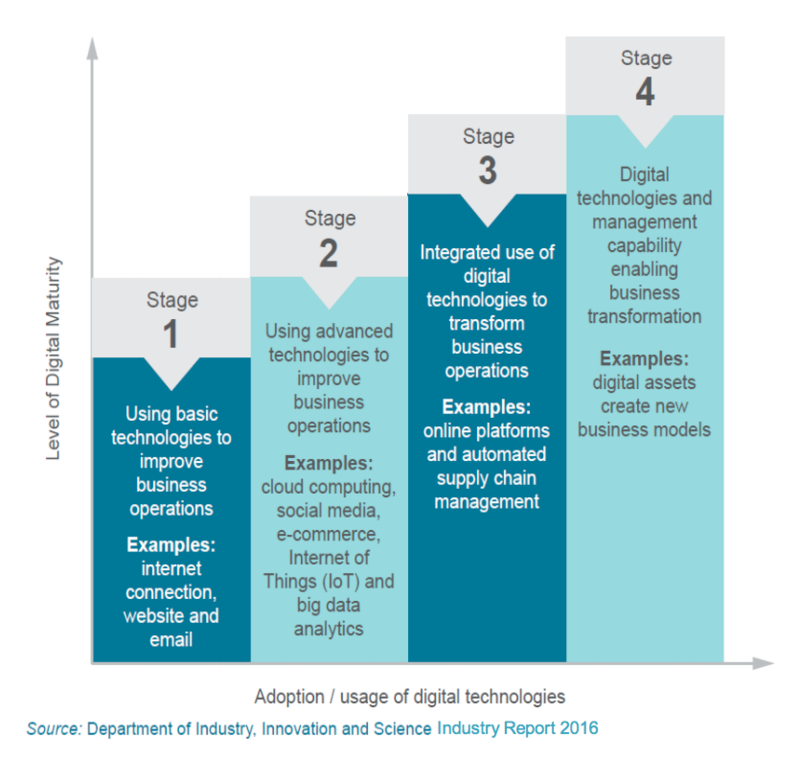 Stage 3 – Using digital platforms to transform business operations. E.g. ERP, supply chain management, channel sales, CRM. Stage 4 – Creating new business models on the back of the digital platforms you have and therefore creating a multi speed business, with new offerings to the customer. The Big Cog – Here at Blirt, we implement medium to large ($20k – $200k+) Salesforce Projects. Larger projects require a more comprehensive technical discovery and therefore have a larger consideration from the client. From enquiry to a quote approval on these projects can take anywhere between 2 weeks and 4 months. The physical execution and training phase can take anywhere between 1 and 8 months, depending on complexity. The Small Cog – For project $10k and under, we identified that a different approach was required to get organisaitons setup inside the Salesforce ecosystem. In fact the comprehensive approach we applied to small projects, that higher value projects were receiving was actually more of a hindrance than a value-add. 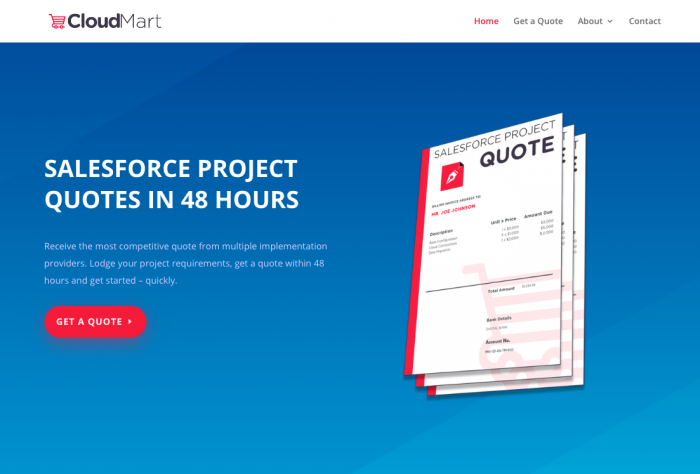 To help those smaller projects deliver a cost-efficient and timely execution, we started a service called CloudMart. Clients with a limited budget simply lodge their brief online, receive a quote within 48 hours inside a clear scope of works and receive a cost effective solution that delivers on their requirements. The Outcome – Blirt still continues to work through those really complex and detailed solutions whereas CloudMart now supports smaller projects at a much quicker and cost-effective rate, without causing any disruption to any other parts of the business. The Big Cog – McDonalds have their traditional fast-food over the desk and drive-thru options. They provide quick, tasty and consistent meals to those who want to treat themselves or those who are on the go. McDonalds wasn’t a place where you would go to meet your friends for a coffee and have a relaxing conversation. The Small Cog – Due to the change in peoples preferences in the places they like to eat, McDonalds invented McCafe to provide an intimate, lounge-booth environment where you can purchase a coffee made by a trained barista. The Outcome – People still stop into McDonalds on road trips and after football matches as they always have. They also so stop in so Mum can get her Caramel Latte from McCafe and meet her friends there through the week, ultimately gearing the franchisees with two different speeds to capture more market share. The Big Cog – The kitchen at the back of every restaurant that churns out breakfast, lunch and dinner with the waitstaff that bring it to your table has been the way modern society dines out for over a century. It’s the bread and butter (excuse the pun) of their daily trade and are subject to the conditions of which they reside; passing foot traffic, convenience of location etc. Because patrons are sitting down and wait for their meal to be cooked and served, time is not as much of an issue and the kitchen operates as such. The Small Cog – The growing trend of consumers preferring to eat restaurant style meals inside their own homes, UberEats now accommodates by picking up meals from those restaurants and delivering them to your door. Because customers want the food as quickly as possible once ordering, time is off the essence and the kitchen needs to operate to suit. The Outcome – For the restaurants that take advantage of this service means that they can still provide their sit-down meals alongside their delivered meals from the one kitchen, at two different speeds while increasing output. How can you turn your business into a two speed model? Is it a new product or service, or perhaps a new market you’ve identified? If you want to introduce the two-speed business model into your organisation, talk to us. The purpose of today’s Podcast is talk about how a multi gear – or two speed business can enable better digital maturity. Well first up, what is a multi speed business? It’s a business that uses different services or products to create slightly different business models that are moving slower or faster than the current business. Why would a business investigate this type of structure? For example, a business doing a sales cycle of 6 weeks might create a business line that shortens sales cycle to 1 week, therefore creating a different dynamic across sales, marketing, cashflow and customer service. How can this enable better digital transformation and ultimately a more mature business? Well first, let’s look at what a digitally mature business is. Stage 2 – using advanced digital tools to improve business efficiency , eg. cloud storage, e-commerce, social media, IOT / big data. Stage 4 – creating new business models on the back of the digital platforms you have and therefore creating a multi speed businessA multi speed business uses digital maturity to spin off new services like cogs in a machine that add value to the core but enable a new customer offering. It’s a good example of a two speed business – customers get fast, quick turnarounds on small and simple CRM projects, whilst we focus on the more complex people intensive projects through our primary consultancy of Blirt. Where else do we see this? One that we’d all know is McDonalds and McCafe…. or Apple with product sales vs subscription sales. In fact, subscriptions are a great way of launching two speed business models. What can a business leader do to get practical? Well, think about where you challenges are and where the market opportunities are, at that intersection is where your problem solving should start. Don’t start a new venture just because you it sounds like a good idea – it must solve a problem for the customer. People may presume that business is about getting results and that KPIS are just a way to get a result. And while in some cases that is true, we’d tend to argue that business is more about creating a stronger community and harbouring positive change. Recently on the Blirt podcast, The Digital Transformation Show, we’ve unpacked our approach to not only setting KPI’s but how to think through them. You can listen to that episode here. So when we ask the question ‘are KPIs all about delivering results?’ The answer is actually, no. KPIs aren’t about getting results? KPIs are the very things that help us to understand whether we are getting the right type of result. We need to understand what matters, what doesn’t, what measurements are used and understand that all KPIS aren’t equal. The approach to setting key performance indicators needs a mixture of both science and strategy. 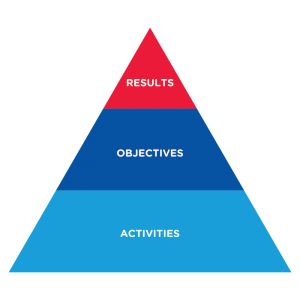 We do this by using a categorisation framework called Results, Objectives and Activities. IMPORTANT: If you, as an emerging leader can understand these principles you hold will hold a competitive advantage over those who don’t. You will have the ability to drive and influence change inside your organisation with clarity (so keep reading). Now this might be scary to hear as a manager but, nobody can manage results. Regardless of your business objective, you actually do not have the ability to directly manage and control the outcome. Results are the very things that happen to you as a result of other things you’ve done. That is the ah-hah moment. When you realise that you cannot control the result, it should feel like a weight being lifted off your shoulders. While we hold ourselves accountable to those results, we shouldn’t destroy ourselves over them simply because they happen – to us. Results happen to you as a RESULT of the way you run your business, not directly. If we want a result, we need to keep adapting to the way that things are. As a leader and manager, this is a mental free pass. When we understand we can influence results but not control them, we can avoid the negative stress that it produces for ourselves and our teams and focus on the things that matter. Objectives are goals with consent. A mutually agreeable goal that two or more parties sign up to and achieve together. Results come from achieving one or many objectives, and to maximise the likelihood of achieving that objective you require all involved parties to agree to it. All parties must sign up. Now here’s the kicker – you can’t manage objectives (ah-hah moment number 2). You can manage systems and process and you can only lead people, but you cannot manage objectives. This is a crucial missing piece of the puzzle for millions of leaders. You still don’t directly control the objective as It’s something that you are striving toward. The only thing we can control – are the activities we do. The only thing you directly control are activities. This is where our best KPI’s should live. If we manage our activities well enough, they’ll lead us to those shared objectives, and by hitting those objectives gives us the best chance for achieving the results. The result $1mil profit which requires 120 product sales. The objective would then be, in order to make 120 sales, we need to make 10 sales per month. Another objective may be to only discount up to 10% so to ensure the profit target is not compromised. Can someone state that they guarantee those 10 sales per month? Of course not. If they could they would own the market and be able to tell the future. Can someone state that they guarantee they won’t discount more than 10%. Yes they can. This is a good objective to set, as you can have more influence over the outcome. However, what impact will the cap on discounting have on sales volume? Is it worth increase discounting to increase sales volume? Based on current sales run-rate, what do we need to leverage? One of the management decisions with mutual consent on the objective would be then to say, for this month we can actually make 12 sales by awarding a 15% discount to two product orders. Great managers can make the decision to break that standing objective in order to work further toward the result. This a great definition of good leadership in management. But can someone state that they guarantee they’ll achieve their daily activities? Yes they can. If the sale person can effectively track their day to day activities, they can have full control over their outputs. While this doesn’t guarantee achieving an objective or result, it will give you the best possible chance. We now understand the three buckets of categorisation that we design KPI’s around, it’s important to now understand that some of those KPIs will be Leading and Lagging KPIs. These are the things that happen to us. These are results and objectives in a past tense. Looking back we can see what happened and by using a lagging indicator we can measure how effective those results and objectives were, for the purpose of contextualising what we do next. This tells us how we’re going and how likely we are to achieve our results. Leading indicators are always activities. I.e. a sales call, response time on customer support, number of meetings, number of quotes or proposals. These are all things we can track and report on but the mere fact that if we achieve that activity in sufficient volume, we actively reduce the risk of not hitting objectives. These are all metrics telling us how we’re tracking toward our objectives. So what can you do to implement some of these changes? Start by casting the vision toward result and ensure there is mutual agreement on objectives – then manage, coach and build up your team so they can be better performers. If you need assistance setting KPIs inside your organisation, speak with us. Alternatively you can download the ‘Leading vs Lagging Indicators’ eBook.